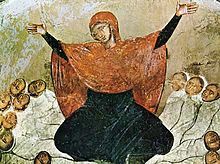 Rachel is weeping for her children, 14th century fresco from Marko’s Monastery. 15 Thus saith the Lord; A voice was heard in Ramah, lamentation, and bitter weeping; Rachel weeping for her children refused to be comforted for her children, because they were not. This entry was posted in de Wert, Giaches (1535-1596) and tagged 1581, A voice was heard in Ramah, album, CPDL, Jeremiah, Jeremiah 31, Jeremiah 31:15, Latin, Matthew, Matthew 2, mp3, Vox in Rama, YouTube by John. Bookmark the permalink.